Roku unveiled a new product line in August of last year, which included the Premiere and Premiere+ as the mid-range and higher-end models, respectively. Both of them were replaced by the Streaming Stick and Stick+ last month, but the Premiere+ is still a great device. 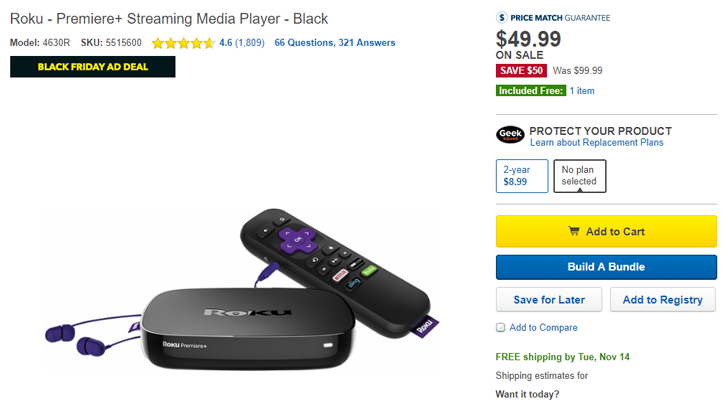 Now you can get it from Best Buy for $49.99, a $50 reduction from the original price. The Premiere+ is a 4K-capable streaming box with support for HDR. It has 802.11ac WI-Fi and an Ethernet jack for network connectivity, and a microSD card for storing local media. The box runs Roku's custom operating system, and there are apps (or 'channels,' as Roku calls them) for just about every streaming service on the planet. That includes Netflix, Hulu, Amazon Prime Video, YouTube, HBO Now, Google Play Movies, and more. Unless you absolutely need a smaller form factor, I would honestly recommend this model over the Roku Streaming Stick+ (which currently retails for $70) that replaced it. The Stick+ doesn't have a headphone jack on the remote, a microSD card slot, or an Ethernet jack. However, the Stick+ does have enhanced Wi-Fi reception and a voice remote (which you can buy separately) over the Premiere+. The Roku OS 8 update is still rolling out to the Premiere+, but it should hit everyone soon. You can buy the Premiere+ from the source link below.